This is a great starter kit to introduce you to the lovely quality of the paints and to set you up with a mini studio of colours. FolkArt 32 Colour Outdoor Acrylic Paint set is a collection of rich and creamy premium quality acrylic paint formulated for use outdoors. They are UV and weather resistant the paint is self-sealing and dries to a satin sheen. You can paint it on a variety of surfaces: unpainted or painted metal, tin, terracotta, wood, stone and concrete. Use for traditional stroke work, stenciling or sponging, colours blend like regular FolkArt acrylic paints and cure in 48 hours. Includes two 2-ounce bottles of Wicker White and Engine Red, 6 44 ounce pots of primary colours and 24 - 0.16 ounce pots of outdoor trend colours. Cures in 48 hours. 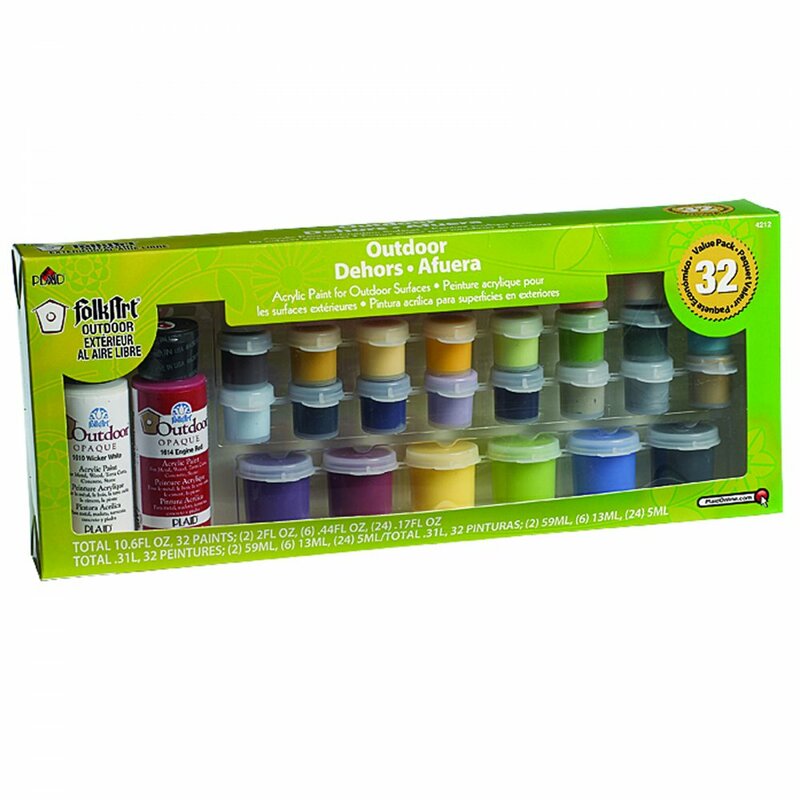 Showing 2 Plaid FolkArt Outdoor Acrylic Paints 32 reviews. Average rating of Excellent. Would you like to write a review? Didn't know exactly what I needed for a painting project. Staff were very helpful and knowledgeable. Paints did a 1st Class job. Great product and price. Paint was as expected. Have only used the paint last week on our walls, but the colours have bit faded so far. Paint was easy to use, and we were able to wash them off our hands a few minutes after using them. No issues.